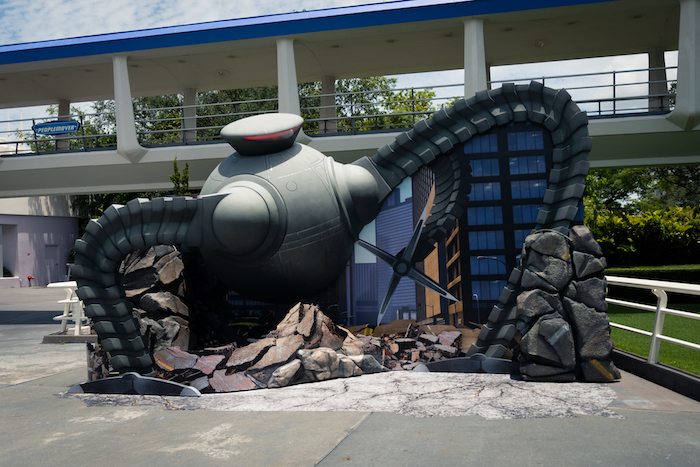 Join us for a photo tour of the brand-new Incredible Tomorrowland Expo! Last week we gave you a glimpse of Donald’s Dino-Bash, one of the fun new offerings at Walt Disney World’s Incredible Summer event. 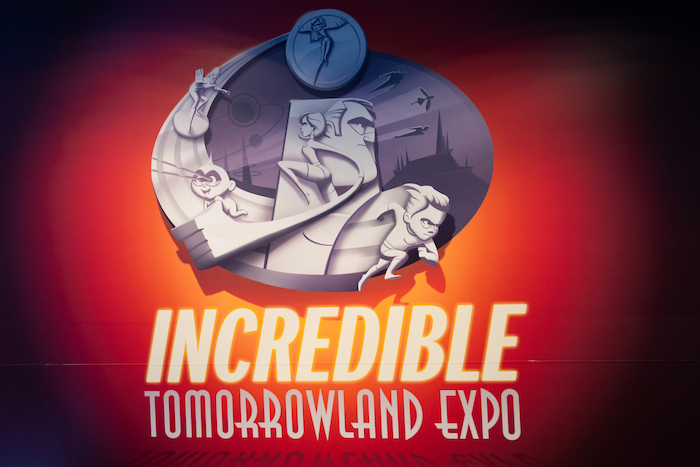 This week we have all the details about the new Incredible Tomorrowland Expo at Magic Kingdom! 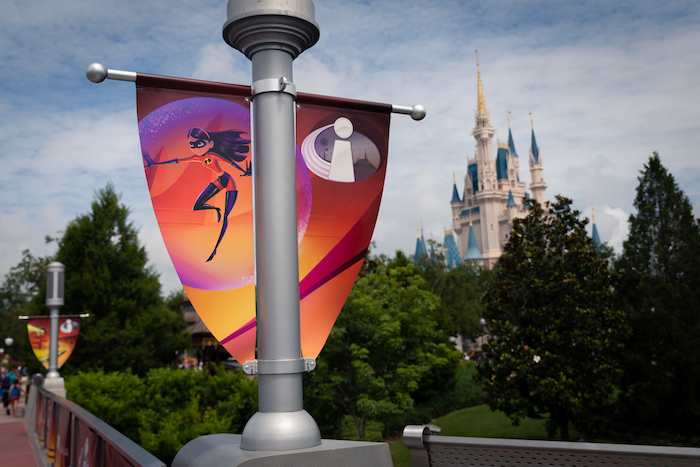 The entrance to the Incredible Tomorrowland Expo at Magic Kingdom. Photo by Courtney Reynolds. 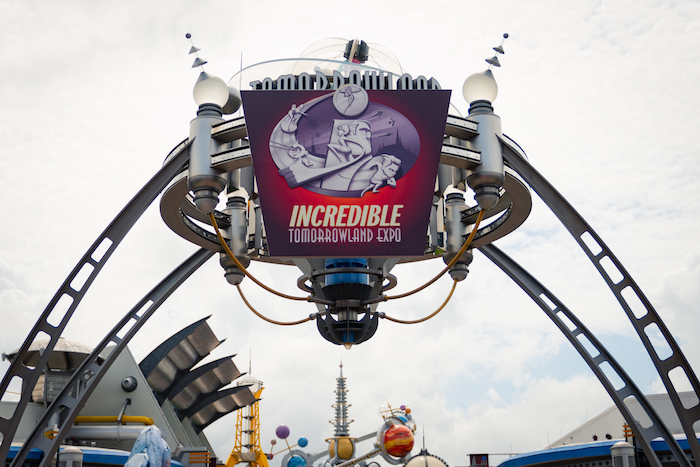 The Incredible Tomorrowland Expo takes place in Tomorrowland at Disney’s Magic Kingdom and runs through Labor Day (September 3rd). 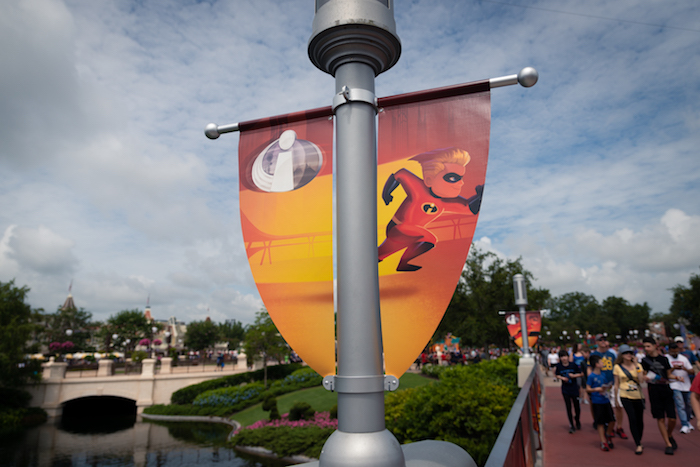 This expo celebrates all things SUPER with special décor, merchandise, characters, food, and shows. 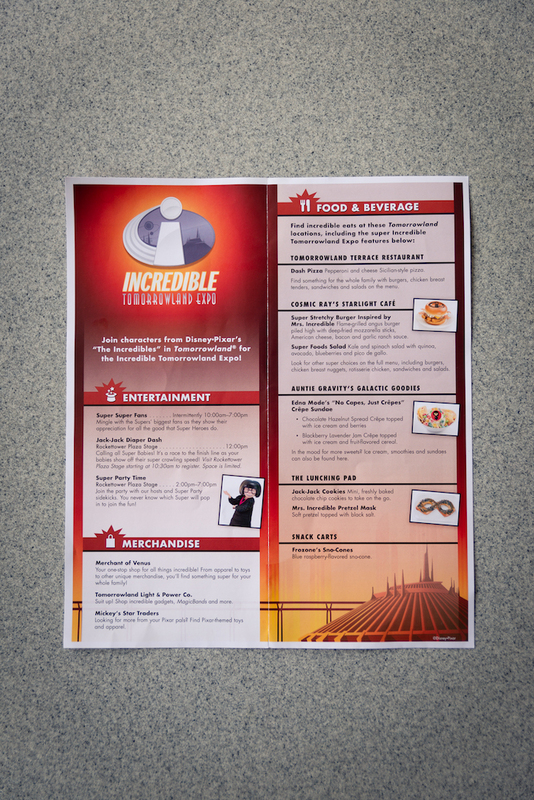 Before we get started, here’s a look at the Times Guide for the Incredible Tomorrowland Expo. This handy little guide has times, details, and locations for everything at the expo. Times Guide for the Incredible Tomorrowland Expo. Photo by Courtney Reynolds. 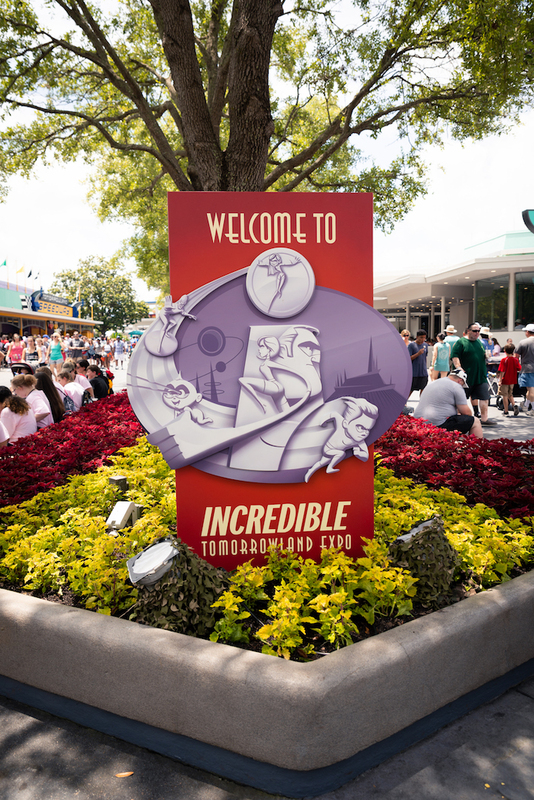 As you explore Tomorrowland, don’t forget to look for all the special expo décor and signage. 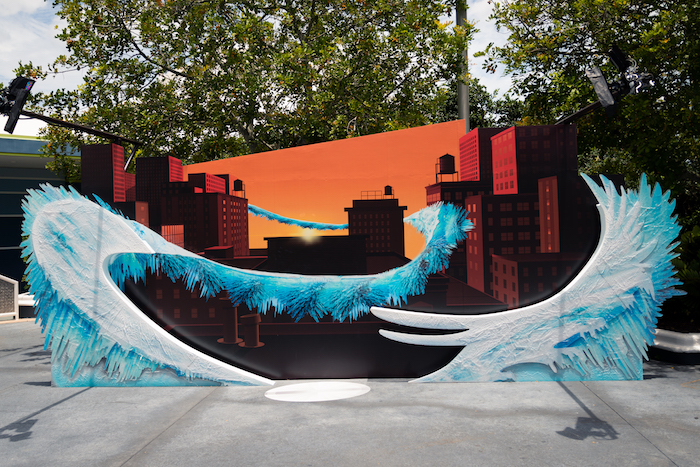 Everywhere you look you’ll find something new! Make sure to listen for the new Tomorrowland background music, which is special just for the event. 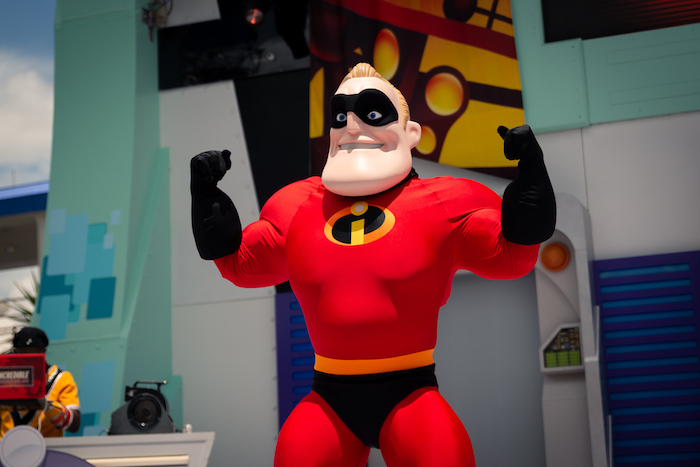 If you listen closely, you might even hear some expo announcements over the intercom seeking help from some very special Supers! 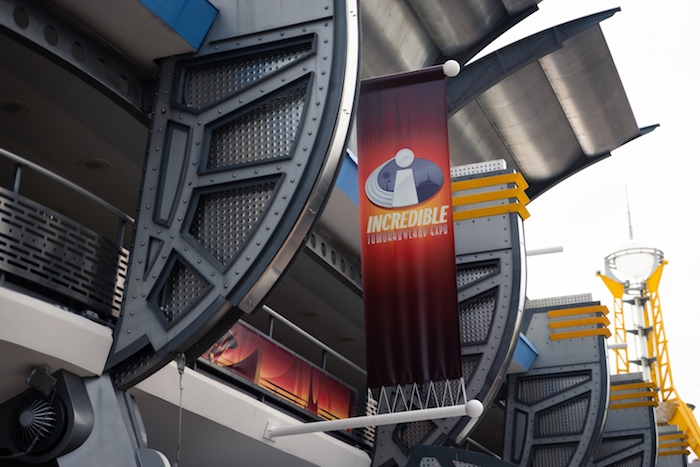 New signage for the Incredible Tomorrowland Expo that can be found throughout Tomorrowland. Photo by Courtney Reynolds. 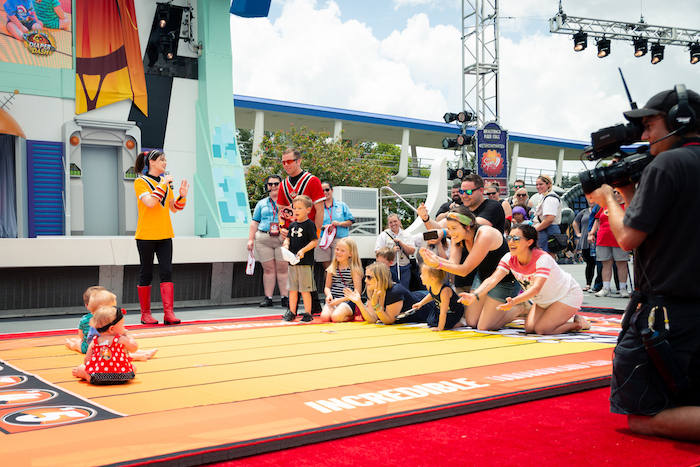 The first show of the day is Jack-Jack’s Diaper Dash! 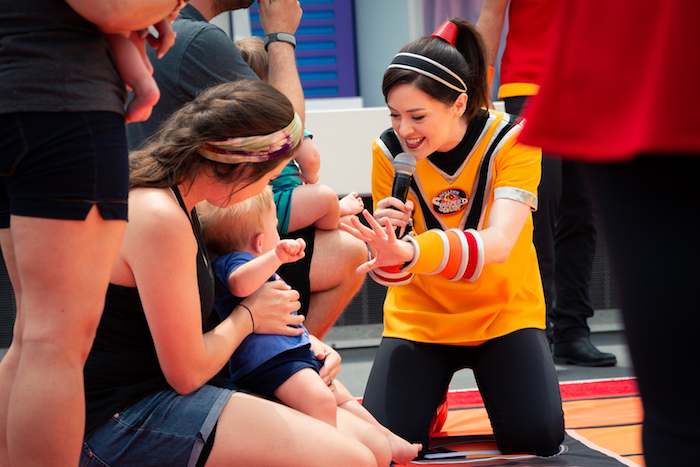 The Diaper Dash takes place at the Rockettower Plaza Stage at 12:00pm and is THE CUTEST thing you will ever see. Families will need to sign up their little ones prior to the event at noon. Each little one is given a number, which determines their place on the race mat. Parents and families are encouraged to cheer on their little one from the finish line. The goal is to see which Super baby can crawl their way to the finish line fastest! 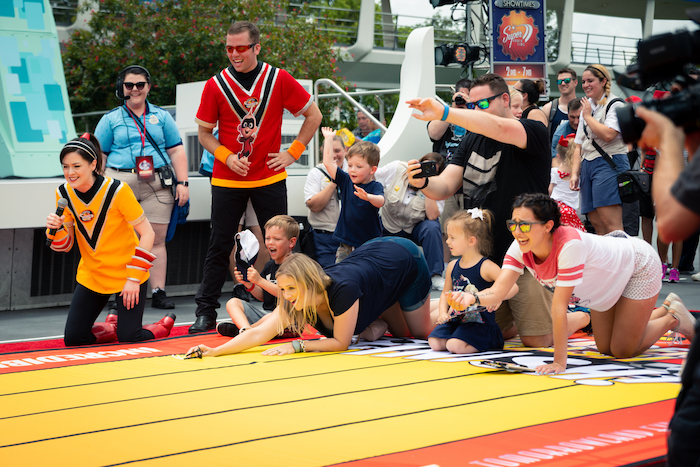 Jack-Jack’s Diaper Dash at the Incredible Tomorrowland Expo. Photo by Courtney Reynolds. After the race, we had the opportunity to learn more about the Incredible Tomorrowland Expo from James, one of the directors behind the new event. 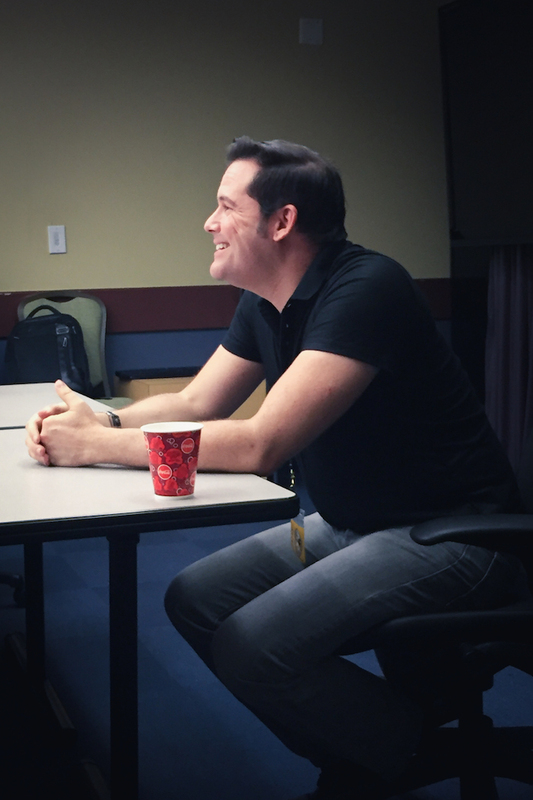 James speaking to media about the Incredible Tomorrowland Expo. Photo by Courtney Reynolds. 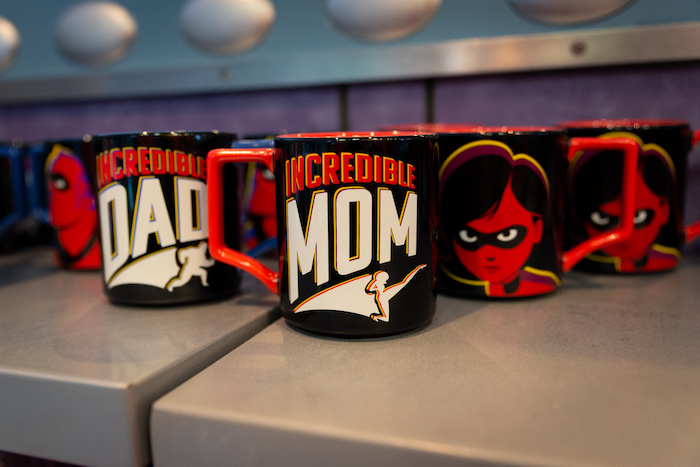 If you’re looking for Incredibles merchandise, make sure to stop by the Merchant of Venus store. 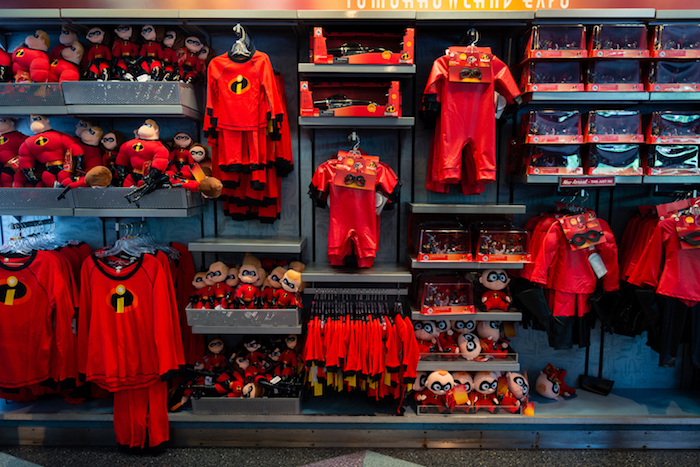 They even have Incredibles costumes for both children AND adults! New wall décor behind the registers at Merchant of Venus. Photo by Courtney Reynolds. Merchandise display at Merchant of Venus. Photo by Courtney Reynolds. 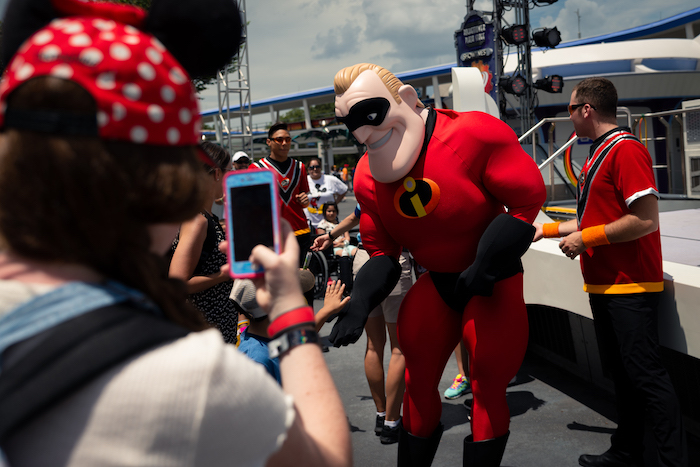 While you’re waiting for Super Party Time to begin, take advantage of the three new PhotoPass opportunities throughout Tomorrowland. Face the Omnidroid. Slide like Frozone. Behold the Underminer! Along the way, you might even run into Mr. Incredible, Elastigirl, and Frozone roaming around the expo! Underminer PhotoPass spot at the Incredible Tomorrowland Expo. Photo by Courtney Reynolds. 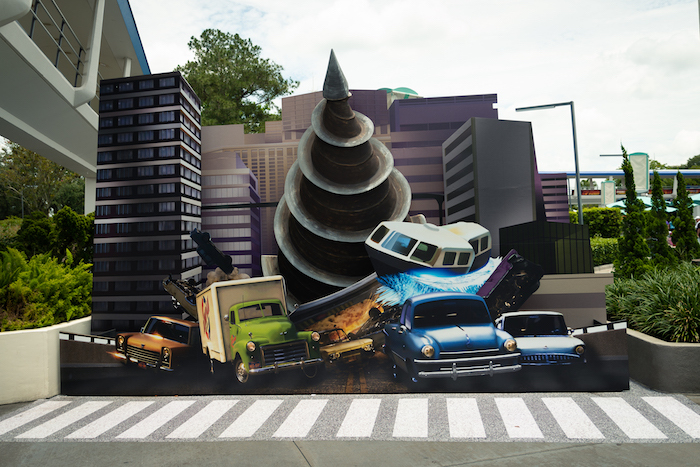 Omnidroid PhotoPass spot at the Incredible Tomorrowland Expo. Photo by Courtney Reynolds. 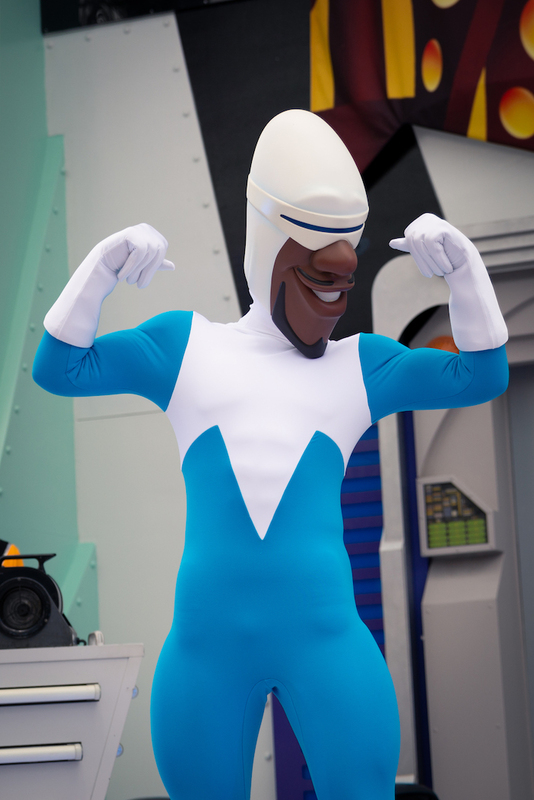 Frozone PhotoPass spot at the Incredible Tomorrowland Expo. Photo by Courtney Reynolds. Don’t forget to try all the specialty food while you’re there! 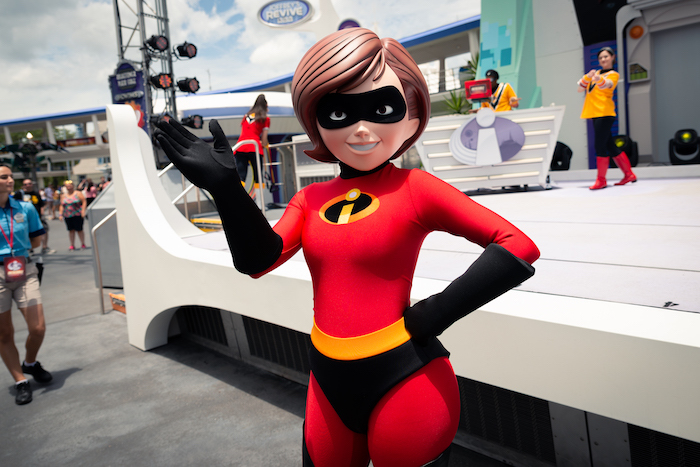 How can you go wrong with a name like Mrs. Incredible’s Super Stretchy Burger? 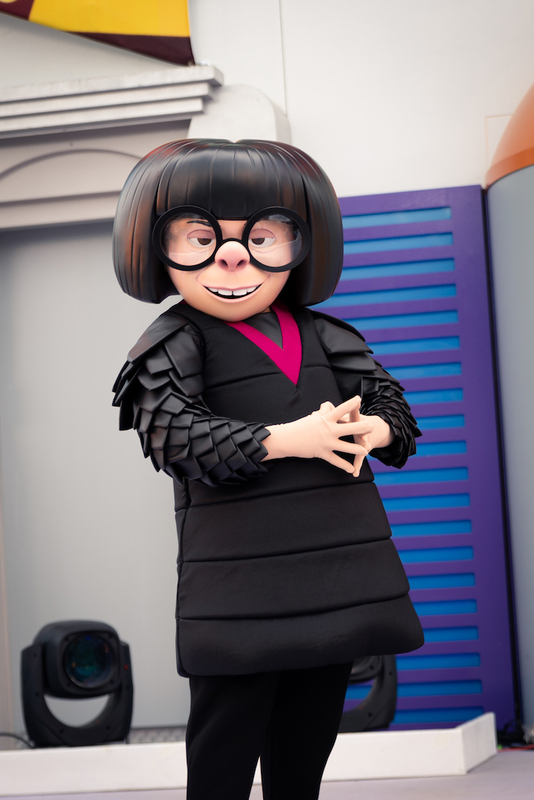 Or Edna Mode’s “No Capes, Just Crêpes” Sundae? 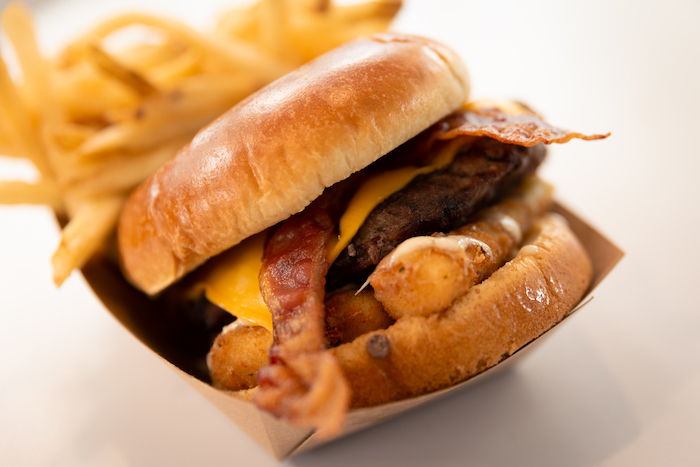 My favorite item is the Super Stretchy Burger, which is topped with American cheese, bacon, mozzarella sticks (yes, you read that right! ), and a garlic ranch sauce. YUM! We also tried one of the crêpe sundaes, which was really refreshing! 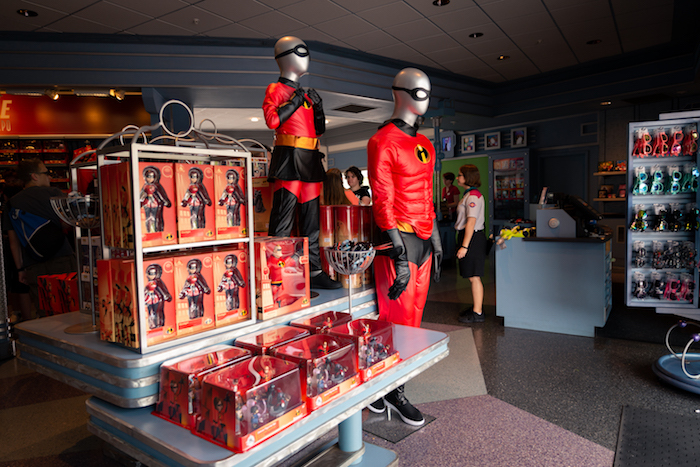 Other specialty food items include: Dash’s Pizza, Super Foods Salad, Jack-Jack Cookies, Mrs. Incredibles Pretzel Mask, and Frozone’s Sno-Cones. 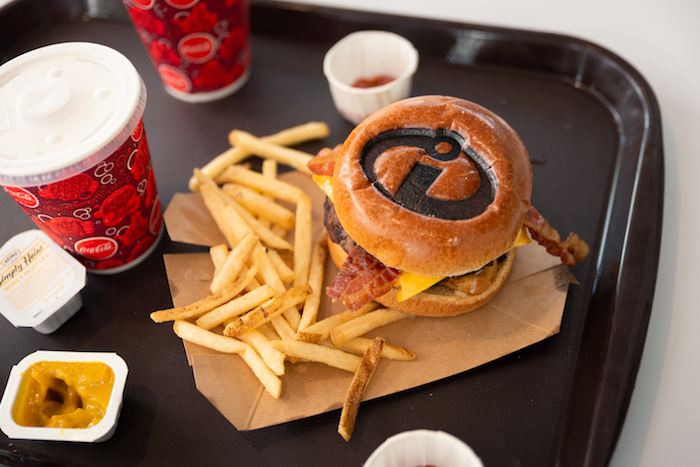 The Super Stretchy Burger at Cosmic Ray’s Starlight Café. Photo by Courtney Reynolds. A delicious offer for Canadians is here. Photo by Courtney Reynolds. 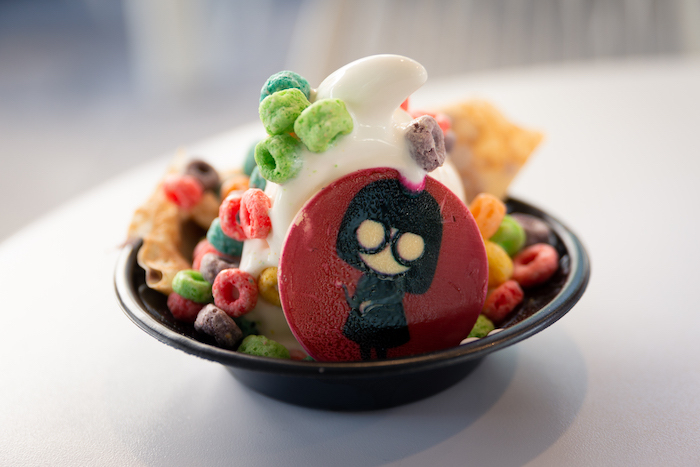 Blackberry Lavender crêpe sundae at Auntie Gravity’s Galactic Goodies. Photo by Courtney Reynolds. Now for the event you’ve all been waiting for: Super Party Time! 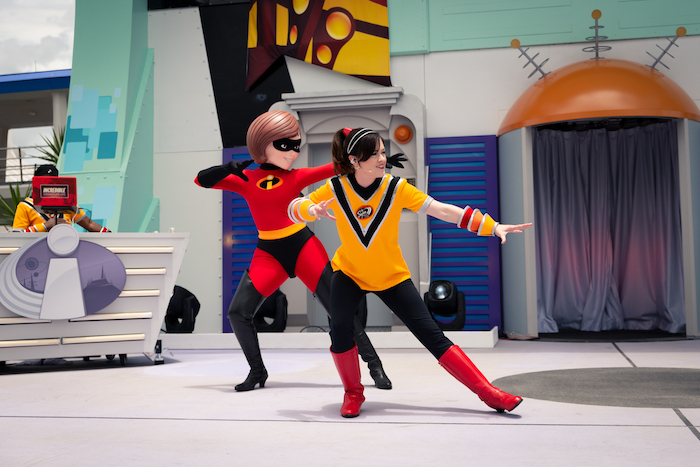 Join The Incredibles for a Super dance party each day from 2:00pm-7:00pm at the Rockettower Plaza stage. This show is part dance party / part talent show so get ready to have some fun! 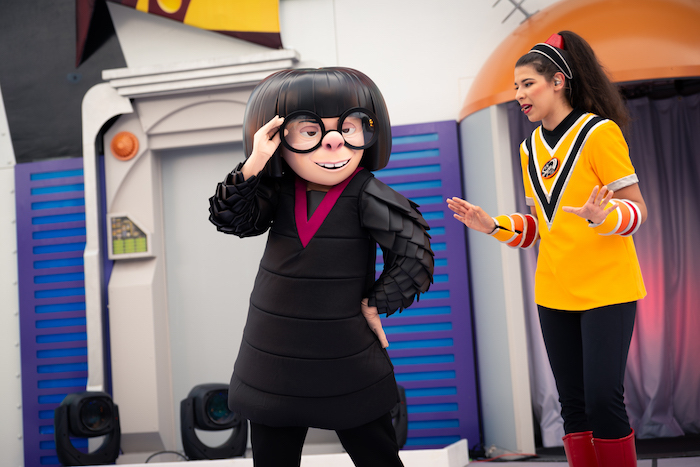 Oh, and there’s one very fashionable special guest that makes an appearance. Just make sure to hide your capes! 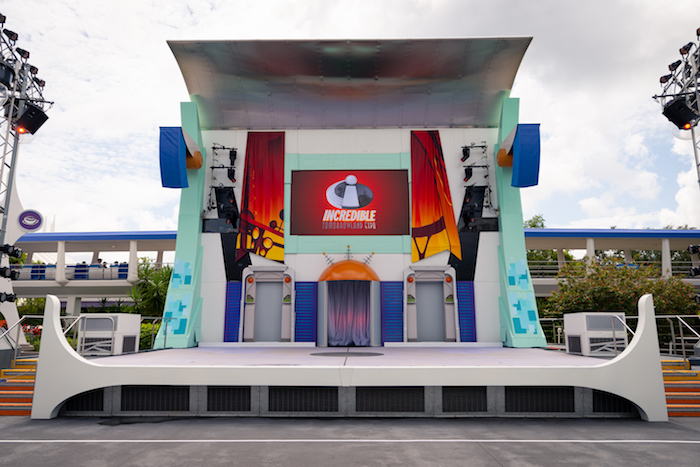 The Rockettower Plaza Stage at the Incredible Tomorrowland Expo. Photo by Courtney Reynolds. Learning how to do the Elastigirl Stretch. Photo by Courtney Reynolds. 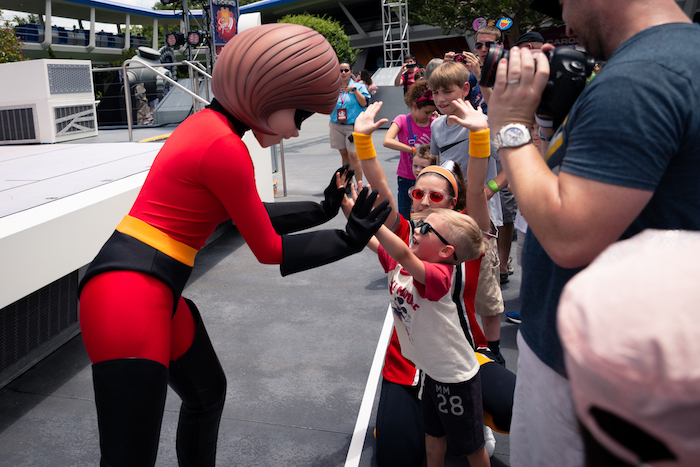 Elastigirl says hello to guests during Super Party Time. Photo by Courtney Reynolds. Up-and-coming sidekick Whippersnapper shows off his Super talent. Photo by Courtney Reynolds. Mr. 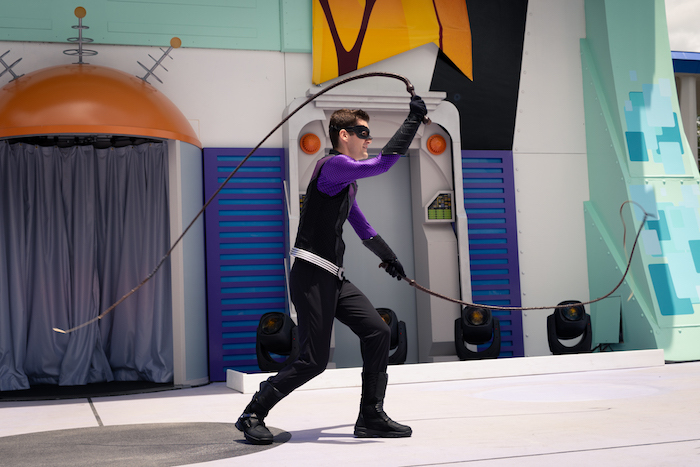 Incredible says hello to guests during Super Party Time. Photo by Courtney Reynolds. 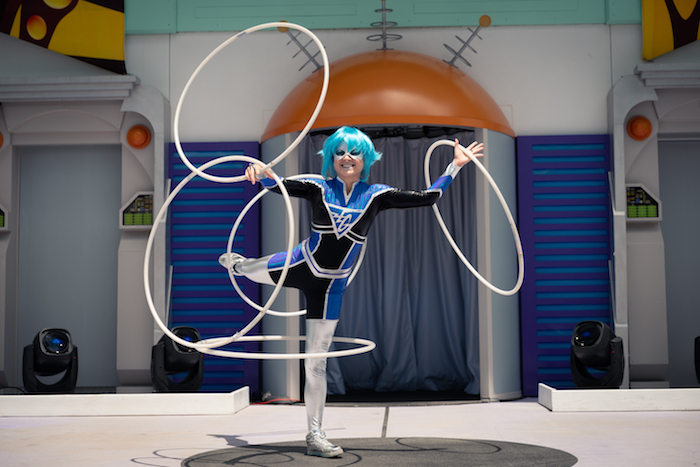 Up-and-coming sidekick Electrogirl shows off her Super talent. Photo by Courtney Reynolds. 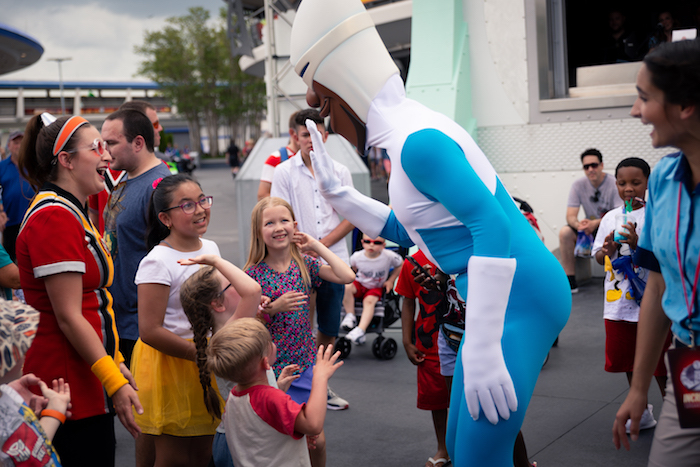 Frozone says hello to guests during Super Party Time. Photo by Courtney Reynolds. 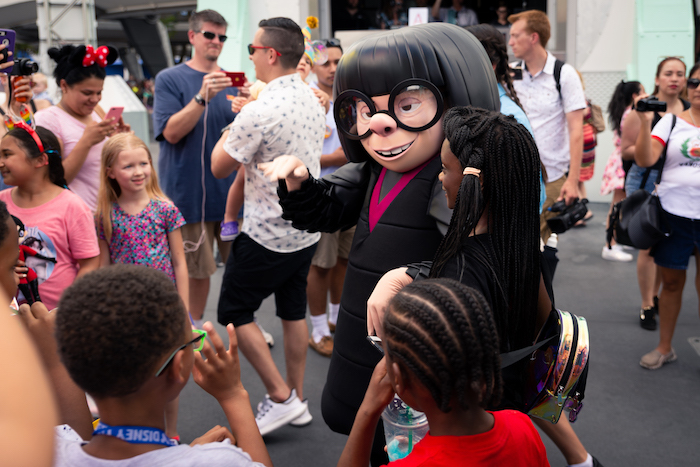 Edna Mode says hello to guests during Super Party Time. Photo by Courtney Reynolds. 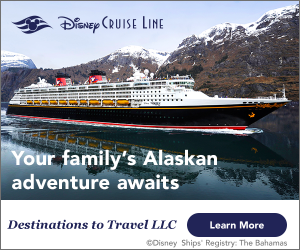 Want to learn more about Summer at WDW? Don’t miss our June issue!